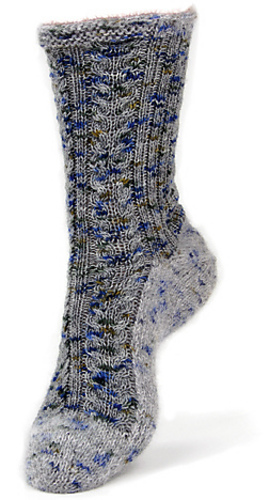 Sock manufacturers knit intarsia motifs and leave trimmed ends hanging inside, and so can we—with the right yarns. I’ve paired a lace-weight mohair/silk blend with a sock yarn for the footbed and cuff (note the color change). The combined yarns strengthen and cushion these hard-wear areas. Cut ends of the lace-weight yarn hang securely inside, held in place by their clingy fibers, and will slowly felt into the fabric. Larger sizes have three pattern repeats up front; sample shown has two.